Drinking a beer at a bar is constructive. Sure. But so is getting your presentation done at a bar. While drinking a beer at a bar. 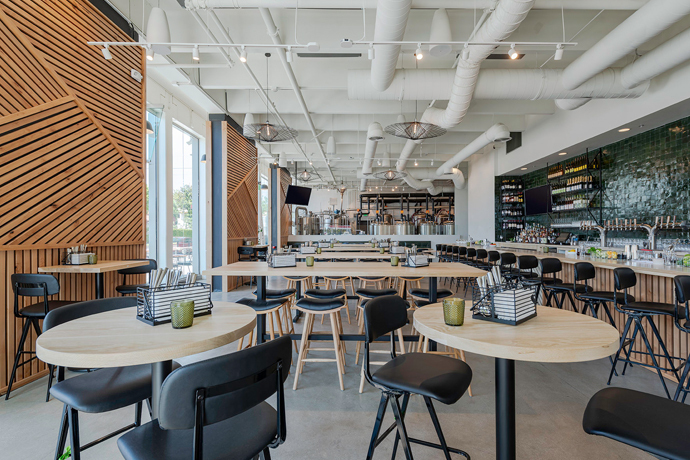 This place has one hell of a counter—a lengthy beam of imbibement stretching between 40 taps and a streak of Pullman booths bound to walls of white brick and light wood. You get all that? Regardless. Let’s move on. It’s a great day spot to set up and do some constructive drinking—the bar’s got built-in USB and power outlets. Or summon some partners to the front communal table and cue the presentation on Kalamazoo red ale with wings spiced with five chilies, build-them-yourself fish tacos or dry-aged sirloin burgers from an Alma vet. Later, you’ll start happy hour dates on the sidewalk patio with barrel-aged Old Fashioneds and humorous observations on Downtown anthropology. As the night advances, you’ll partake of your milk stouts and bourbon bread pudding in the more private back area. You’re about to do unconscionable things with that bread pudding.